A tour company that specialises in trips to North Korea has created a stir by signing a sponsorship deal with an English football club. Visit North Korea, a tour company that runs trips to Pyongyang and beyond, has signed a sponsorship deal with semi-professional outfit Blyth Spartans, Travel Mole reports. The deal became public on Boxing Day when adverts and banners were displayed pitch-side during the club's match against Spennymoor Town. An announcement about the deal was published in the club's match program on the same day. Visit North Korea is a private company set up in 2015 by founder Tom Fowdy. 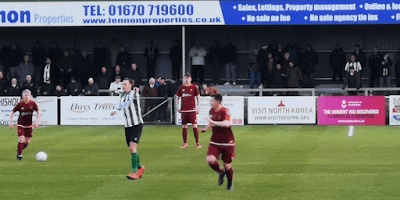 Blyth Spartans commercial manager Mark Scott said the sponsorship deal involved the club's "most unique pitch-side advertising board to date". He said: "Having seen the recent Michael Palin documentary I was certainly interested by the country despite negative views on the country's politics." He told the local Blyth Chronicle newspaper the agreement did not amount to an endorsement of the North Korean regime. "Who am I to judge?" he said. "The guy running [Visit North Korea] is going over to visit the country, not shake hands with Kim Jong-un, so we have no problem with it." Interestingly, Blyth Spartans, which plays in the Northern League North Division, is based just north of Newcastle upon Tyne. Its stadium, called Croft Park, has capacity of 4,400. Nearby Middlesbrough was where the North Korean national football team made global headlines during the 1966 World Cup finals, beating Italy 1-0 and qualifying for the quarter-finals.